A questionable report from South Korean sources suggests that Apple is preparing a new display without a notch —for phones 18 months down the road. ETNews declared on Wednesday that "according to industries" Apple is examining new possibilities for OLED technology to deal with the notch. Ideas floated by the publication including drilling holes into OLED panels, or using so-called "Black Matrix" areas within the displays themselves. 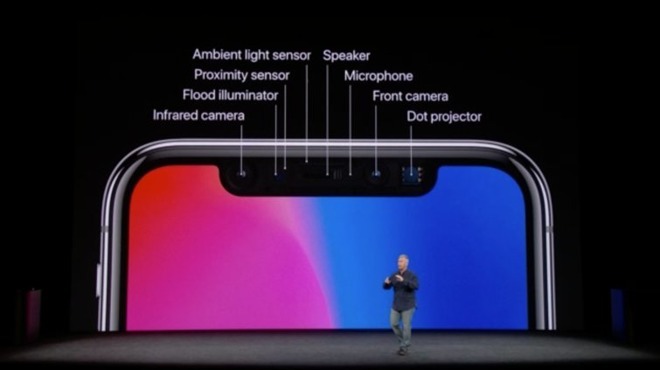 Other than the vague "industries," ETNews didn't name sources, or particular manufacturers that were working on the notch-free 2019 iPhone. As such, and given the timetable between now and the fall 2019 releases, it seems probable that the publication, or its sources, are making an educated guess at Apple's future intentions regarding a true all-screen iPhone. At present, the technology does not seem to exist to eradicate the notch entirely, and have an edge-to-edge screen. Current VCSEL technologies aren't small enough to fit in the very small area between the screen and the bezel, nor are other camera or speaker technologies advanced enough to go in that gap either. While ETNews does fairly well with general supply chain reports, the publication has a poor track record at predicting Apple's future moves. The 2018 iPhone lineup is expected to retain the notch. Apple is said to be doling out display orders for its next-generation iPhone lineup, which is rumored to include two OLED versions — 5.8 and 6.5 inches — and a 6.1-inch LCD variant. A wide variety of Android device manufacturers debuted phones with a notch to hold sensors at the 2018 Mobile World Congress.